"Accompanying another in a difficult world"
As I began to accompany the people of Pankisi, rather than look for ways I could make a difference, for things that needed fixing, I began to really listen and see. I discovered that crushing poverty and stinging prejudice don't hide behind the spectacular beauty and natural abundance of the Gorge; they live right along side each other in the tension of the paradox, where the Kists and Chechen people live. This is the place their stories talk about. I listened to those stories; to what was and wasn't said. I continue to listen and to accompany. The Pankisi Women's Story Project started when a 63-year-old Peace Corps volunteer listened to what the women of the Pankisi Gorge said they wanted ... for their families, their communities, and for themselves. They didn't want hand-outs. They wanted to be heard, to matter. They want to share their stories - complex, difficult, and hopeful - with others, because they hope sharing those stories can help them make a difference. The women thought of traveling around Georgia to tell their stories to other Muslim women's groups. But they quickly realized how difficult that would be. If only they could record their stories so that the stories could travel on their own. Suze Rutherford, the Peace Corps volunteer, told them she'd try to help their stories travel. She enlisted a Seattle filmmaker who volunteered her skills and time to make a documentary of the women's stories. She enlisted her brother's non-profit organization to help the women raise the money to pay for the filmmaker's travel expenses. Now it's your turn to help these women in the Pankisi Gorge share their lives and hopes in a way that lets all of us accompany them in their difficult world. Felting is one of the arts practiced by the women of Pankisi. To see some of their felted art (and much more), visit Suze's SuzeGeorgia blog. The women of Pankisi who serve on the Women's Council as a voice for women's rights and issues to the all-male Council of Elders, wanted to be heard, to matter. They want the Elders to hear the voices of women, old and young, in Pankisi. They want to help women find their voices. Read more about Pankisi women's Lives & Hopes or about Women's Groups in Pankisi. Suze in the middle with some members of the Women's Club: teachers, felters, office workers; all are volunteers and friends. 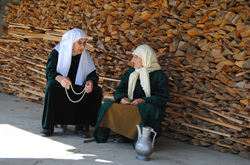 KRDF’s goal is to contribute to durable solutions for the problems facing Chechen refugees, the local Kist population, and IDPs residing in the Pankisi Valley of the Kakheti region of Georgia. It implements various projects aimed at poverty relief, livelihood opportunities, skills training, and legal assistance.